Hideo Kojima's latest game shows that length is not a detriment to quality. 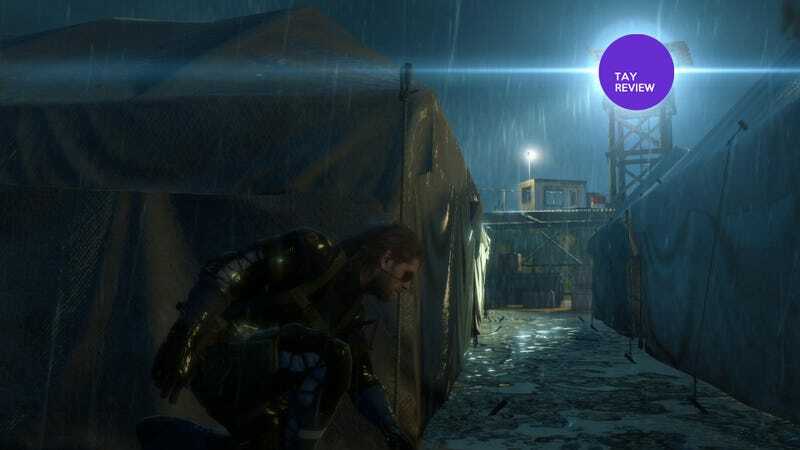 Metal Gear Solid V: Ground Zeroes takes place some time after the events of Metal Gear Solid: Peace Walker. We have our protagonist Naked Snake, this time voiced by Keifer Sutherland, searching for Paz and Chico who have been taken prisoner by a man addressed solely as Skullface. After the brief introductions you're all set for the mission. While not the graphical revolution that MGS 2 or MGS IV were for their time, the graphics for Ground Zeroes are still quite impressive. I played on the PS3 and although the machine has seen better days it shows that it's still got some juice in those cells. Seeing a favorite director's work over the years really shows how much better they get with age. The cutscenes in the game (of which there are few) are set up very dramatically. The flow of the shots is considerably noteworthy as it takes you from the air to the ground and back again without missing a beat. Series veteran Harry Gregson-Williams returns to set the tone for this game. The music is at times so understated that I wasn't even sure if it had music at all. This of course was remedied after I stopped being stealthy and went guns blazing. That shift has always added to the tension and it is exhilarating. Mr. Sutherland has taken voice duties this time around over David Hayter who has portrayed Snake since 1997. While not doing a completely and utterly awful job as Naked Snake, its a bit jarring to hear him say, "Kept you waiting huh?" Ground Zeroes does not hold your hand and tell you every single facet of its gameplay. While I had no trouble getting used to the way it handled itself, some people may be turned off by the fact that they may have to pause and go through the menus in order to find out how to do a specific action. That being said anyone who has played Peace Walker should feel familiar by the way this game controls. Thanks to space age technology, Snake now has a little device called the iDroid. Its nifty for playing back any information he finds while on the field and it also displays a map thanks to the magic of holograms. Unfortunately its the weakest map of the entire series. I had trouble finding where I was most of the time and locating the objective felt cumbersome. I can only hope that it gets improved somehow by the time The Phantom Pain is released. Now you may have noticed that I've yet to discuss how long it took me to play through the primary campaign. For the purposes of this review I thought I'd try something completely different and show you how long it took me to get it done. This is how long it took me from pressing start and then returning to the main menu once the credits rolled. I never checked to see how long it took til I pressed stop on the timer. The game was worth my time and I would still recommend it despite the brief period spent. Game length and monetary worth will be discussed from now until the next game is released and it will spawn a thousand articles both pro and con. Let's not kid ourselves by thinking that a 2 hour game is somehow lesser of a product. After playing Ground Zeroes I wanted more and that's exactly what it achieves. I can't wait until Phantom Pain is released. In the mean time, I think I'll play some Side Ops.